For other uses, see Heroes' Cemetery (disambiguation). Heroes' Cemetery, officially known as Libingan ng mga Bayani (LNMB), is a national cemetery within Fort Bonifacio (formerly Fort William McKinley) in Western Bicutan, Taguig, Metro Manila, Philippines. First established in May 1947 as a fitting resting place for Filipino military personnel from privates to generals who served during World War II, it eventually became designated as the official place of burial for deceased Philippine presidents, national heroes, patriots, National Artists and National Scientists. Among those buried in the cemetery are Filipino soldiers who died during the Philippine Campaign and the Liberation of the Philippines in World War II from 1941 to 1945. Among the Filipino leaders and dignitaries buried there are Presidents Elpidio Quirino, Carlos P. Garcia and Diosdado Macapagal; former Vice President Salvador H. Laurel; generals Artemio Ricarte and Carlos P. Romulo; Armed Forces of the Philippines (AFP) Chief of Staff Angelo Reyes; and former Senate President and proclaimed Vice President Arturo Tolentino and Blas Ople. Former President and dictator Ferdinand Marcos is the most recent president to be buried there, after the Supreme Court of the Philippines dismissed petitions against his burial on November 8, 2016, though controversies continue to run rampant whether his real corpse was used for the burial or is still buried in Ilocos. The cemetery was first established in May 1947 as the Republic Memorial Cemetery. It was first established as a tribute and final resting place for the 33,520 to 58,780 Filipino soldiers who died during the Philippine Campaign (1941–42) and the Allied Liberation of the Philippines (1944–45) in World War II. It was established as the Filipino counterpart to the Manila American Cemetery and Memorial, which houses the remains of United States personnel who died during the same war. "To perpetuate the memory of all the Presidents of the Philippines, national heroes and patriots for the inspiration and emulation of this generation and of generations still unborn..."
While such National Pantheon was never established during Quirino's lifetime, several decrees and laws passed under succeeding administrations led to the eventual use of the Republic Memorial Cemetery as a national pantheon described in Republic Act 289. On 27 October 1954, President Ramon Magsaysay renamed the Republic Memorial Cemetery as the Libingan ng mga Bayani. On 28 May 1967, President Ferdinand Marcos issued Presidential Proclamation No. 208 ordering the reservation of 142 hectares of land within Fort Bonifacio in consideration for the Libingan to serve not only as a cemetery for military personnel but also as a national shrine for fallen heroes. He ordered it placed under the administration of the Military Shrines Services of the Philippine Veterans Affairs Office, an agency under the Department of National Defense. On 9 April 1986, Armed Forces of the Philippines Chief of Staff Fidel Ramos and President Corazon Aquino issued Armed Forces Regulations G 161-373, also known as "The allocation of Cemetery Plots at the LNMB". This military-issued regulation established the internment policy that would become the basis for the burial of personalities at the Libingan ng mga Bayani. Moreover, by virtue of Executive Order No. 131 issued by former President Fidel Ramos on 26 October 1993, National Artists and National Scientists of the Philippines were also made eligible for interment at the cemetery. 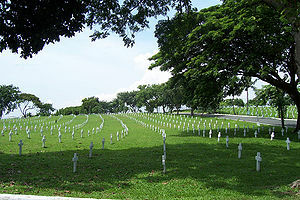 In 2007, due to overcrowding at the Fort Bonifacio site, the cemetery's administration started exploring sites for Libingan ng mga Bayani annexes in Luzon, Visayas and Mindanao. Only one has been completed so far, the ₱24-million, five-hectare extension at Camp Hernandez in Dingle, Iloilo. On 18 November 2016, former president Ferdinand Marcos was buried in a private ceremony with military honors, amid much controversy resulting in a handful of protests in various parts of the Philippines. The cemetery is administered and maintained by the Grave Service Unit (GSU), a unit of the Philippine Army Support Command of the AFP. Its mission is to provide burial and niche services to deceased military personnel and other personalities interred at the cemetery. Aside from maintaining the cemetery and the military grave site at Manila North Cemetery, the unit is also capable of providing mortuary and memorial services to authorized personnel. However, the same regulation also prohibits "personnel who were dishonorably separated/ reverted/ discharged from the service and personnel who were convicted by final judgment of an offense involving moral turpitude" from interment at the Heroes' Cemetery. The first structure that visitors will see upon entering the grounds of the cemetery complex is the Heroes Memorial Gate, a large concrete tripod with a stairway leading to an upper view deck with a metal sculpture at the center. Erected on opposite sides of the main entrance road near the Heroes Memorial Gate are two 12-foot high black stone walls which bear the words that General Douglas MacArthur uttered during a journey to the Philippines in 1961: "I do not know the dignity of his birth, but I do know the glory of his death." The main structure, located at the center of the cemetery, is the Tomb of the Unknown Soldier, where wreath laying ceremonies are held when Philippine government officials and foreign dignitaries visit the cemetery. Inscribed on the tomb are the words: "Here lies a Filipino soldier whose name is known only to God." Behind the tomb are three marble pillars representing the three main island groups in the Philippines: Luzon, Visayas, and Mindanao. There are several pylons as well commemorating the gallantry of Filipino soldiers who died in various wars in world history. These include the Korean Memorial Pylon, which honors 112 Filipino officers and men who were members of the Philippine Expeditionary Forces to Korea (PEFTOK) who perished during the Korean War; the Vietnam Veterans Memorial Pylon, which was dedicated to the members of the Philippine contingent and Philippine civic action groups (PHILCON-V and PHILCAG-V) that were sent to Vietnam during the Vietnam War from 1964 to 1971; and the Philippine World War II Guerrillas Pylon, which was erected by the Veterans Federation of the Philippines as a testimony to the indomitable spirit and bravery of the Filipino guerrillas of World War II. ^ "Philippine dictator Ferdinand Marcos given controversial hero's burial". The Guardian News. 18 November 2016. Retrieved 7 December 2017. ^ "Supreme Court allows burial of Marcos at Heroes' Cemetery". CNN Philippines. 8 November 2016. ^ "Philippine dictator Marcos given hero's burial". Bangkok Post. 18 November 2016. ^ a b c d e f g h La Putt, Juny. "Libingan ng mga Bayani (Cemetery of the Heroes)". CorregidorIsland.com. Retrieved 16 August 2016. ^ "Libingan ng mga Bayani". Taguig Landmarks. City Government of Taguig. Retrieved 16 August 2016. ^ Rodell, Paul A. (2002). Culture and customs of the Philippines. Greenwood Publishing Group. p. 93. ISBN 0-313-30415-7. Retrieved 16 June 2009. ^ a b "Republic Act No. 289-An Act Providing for the Construction of a National Pantheon for Presidents of the Philippines, National Heroes, and Patriots of the Country". Chan Robles Virtual Law Library. Retrieved 1 July 2011. ^ a b c "Why not Libingan ng mga Pangulo instead?". ABS-CBN News. Retrieved 16 August 2016. ^ "Libingan ng mga Bayani". Our Heritage and the Departed: A Cemeteries Tour. Presidential Museum and Library. Archived from the original on 28 September 2015. Retrieved 16 August 2016. ^ "Quick facts about the Presidency". Presidential Museum and Library. Retrieved 16 August 2016. ^ a b c D. Pascual Jr., Federico (23 April 2011). "Trudging back to old haunts and bad habits". The Philippine Star. Retrieved 7 August 2013. ^ a b c Elena, Aben (27 May 2016). "AFP explains rules for 'Libingan ng mga Bayani'". The Manila Bulletin. Retrieved 16 August 2016. ^ a b Dizon, Nikko (4 November 2007). "Burial space for soldiers running out". Philippine Daily Inquirer. Retrieved 16 August 2016. ^ a b "Armed Forces: Instruction was to keep Marcos burial a secret". The Philippine Star. 18 November 2016. ^ "Protesters take to streets to denounce Marcos 'Libingan' burial". ^ "LIVE updates: Protests after Ferdinand Marcos' burial". Philippine Star. Retrieved 2016-11-19. ^ a b c Dizon, Jaymee T. Gamil, Nikko. "After 60 years, President Quirino gets burial he deserves". Philippine Daily Inquirer. Retrieved 19 November 2016.